Conventional geography’s boundary line between a “Southeast Asia” and an “East Asia,” following a “civilizational” divide between a “Confucian” sphere and a “Viet­nam aside, everything but Confucian” zone, obscures the essential unity of the two regions. This article argues the coherence of a macroregion “Sino-Pacifica” encom­passing both and explores this new framework’s implications: the Yangzi River basin, rather than the Yellow River basin, pioneered the developments that led to the rise of Chinese civilization, and the eventual prominence of the Yellow River basin came not from centrality but rather from its liminality—its position as the contact zone between Inner Eurasia and Southeast Asia. In a sense . 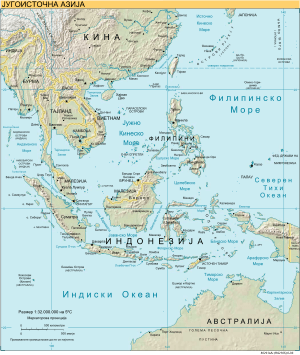 . . the frontier of Southeast Asia has retreated slowly from the line of the Yangzi (in what is now central China) to the Mekong delta (in what is now southern Vietnam). [T]he Vietnamese-Lao wars of the seventeenth century were resolved wisely when the Le rulers in Vietnam and the Lao monarch agreed that every inhabitant in the upper Mekong valley who lived in a house built on stilts owed allegiance to Laos, while those whose homes had earth floors owed allegiance to Vietnam. The question of boundaries is the first to be encountered; from it all others flow. In conventional geography, the largest division of the human community is the continental or subcontinental scale “world region.” World regions are the most useful as concepts when their boundaries can be seen as enduring, immobile, and, above all, easy to map. Yet, in the first quotation above, we see a border between two world regions, Southeast and East Asia, that rolls southward thousands of miles over thousands of years. In the second quotation, we see a border between two kingdoms within the same world region, Southeast Asia, that cannot be traced as a simple line on the ground, being created by the contrasting cultural preferences of inextricably mixed populations. The moving boundary and the undrawable boundary are actually the same, the frontiers between Sinified Vietnam and its un-Sinified neighbors.